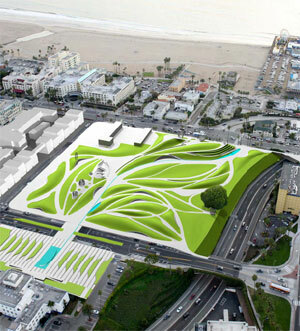 Last year, James Corner Field Operations won the commission to design the new Santa Monica Civic Center parks, which includes a new town square and Palisades garden walk. Designs for the seven-acre, $25 million project were recently unveiled, showing an “ambitious, layered” proposal that will be broken up into a number of “systems,” writes The Architect’s Newspaper. These systems are a set of “colorful and diverse zones” that enable different experiences for park visitors. According to The Architect’s Newspaper, the new landscape includes a set of zones: “view-centric hills, sheltered bays, and meandering pathways surrounded by plants, fountains, and small creeks.” There’s a Grand Bluff, which will provide views of the ocean and neighborhood. Garden Hill will offer the “widest variety of plant life on the site.” A new Gathering Hill is designed for “congregation and relaxation.” The Discovery Bay is a new kids play area and will include “an area shaded by large trees that will contain extra large steel slides, forts, and other activities.” The Town Square, which local respondents to a survey said had too much pavement, will get a new reflecting pool, reflecting the city hall. Associate Partner Lisa Switkin said: “We want people to have several ways of experiencing the park. The topography gives it a very clear structure.” The “hilly” project was inspired by the Arroyo Wash, a “dried riverbed that once ran through the site.” In addition, there are common design elements spread through the new sites, which are expected to give the area a new identity. “Most will be made of stainless steel slats and complemented with curved precast concrete benches. 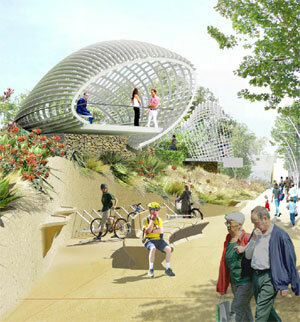 The most dramatic will be the large clamshell-shaped steel viewing platforms located on the Grand Bluff.” The project includes all native plants that are designed to subtly show seasonal change, along with water conservation technologies that will help make the site a more sustainable one. As part of the design process, Field Operations surveyed hundreds of local respondents to determine their priorities. 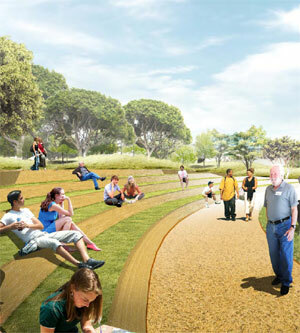 The team of landscape architects found that locals wanted “improved connectivity, circulation and access;” play and “discovery” elements to be embedded in different areas of the park; high ocean views; and bike bays at the edges of the park to discourage bike riding through the park center. As a result, the team improved the connectivity at the northeast corner of the site, better incorporated play throughout the park, increased the height of views, and added more bike parking. 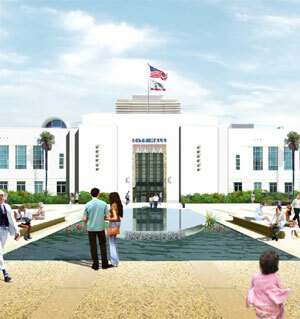 The landmarks and coastal commissions will review the Town Square and ocean view components of the design, and then the city council will do a final vote on the project in June. If approved and state funds are available, construction will begin next spring and will be completed by spring 2013. However, funding may still be a big issue. According to The Santa Monica Mirror, Governor Jerry Brown has proposed cutting all state redevelopment agency funding in an effort to close the state’s massive $25 billion budget gap. Karen Ginsberg, the assistant director of the community and cultural affairs department, said plans will move forward despite the potential funding challenges. If the state fails to finance this, it’s not clear where the funds will be found though. Check out Field Operation’s design proposal and see an earlier post on the design process. Next Article Which Cities Are Smarter? I love the looks of it, BUT what makes it sustainable. All I see is a bunch of people sitting around. By the time it’s finished we’ll be growing local food as the price of fuel will make us. I’d rather see more functional use of land to give us seld reliance, not a nice place to just sit.